Top seed Keith Opie (pictured) will play against unseeded G.T.T.A. 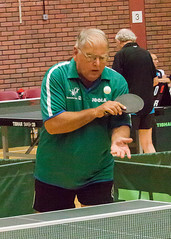 president Derek Webb in Thursday evening's final. Opie was required to overturn a 3-1 deficit in the Quarter final against Ken Falla to win in 7. His semi final encounter with Maurice James was decided in 6 games. 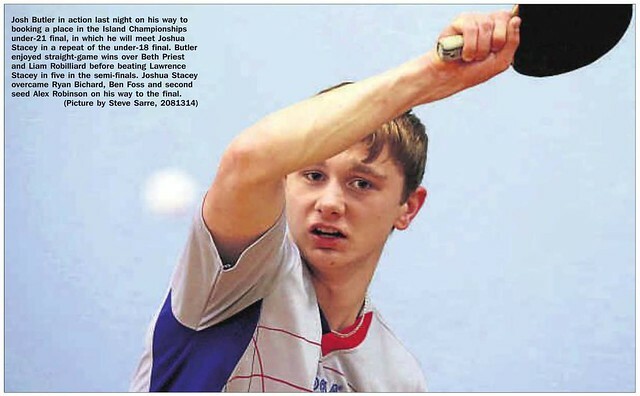 Webb played some high quality table tennis to see off number 4 seed Ian Fitchet in 6 games before defeating 2nd seed Chas Elliott in straight games. All Island Championship finals will be contested tomorrow evening commencing at 7pm. The respective CI Championship finals against Jersey will take place in Guernsey on Friday evening, with the Inter-Insular team events being played on Saturday, culminating in the Green Trophy during the evening. The top seeded combination of Joshua Butler and Alex Robinson will contest the final against 2nd seeded twins Joshua and Lawrence Stacey. Butler and Robinson reached the semi finals with straight game wins over Callum Gilson/Ellis Tomlin and Ryan/Luke Bichard. They surprisingly dropped the opening 2 legs of their semi final clash against 3rd seeds Ben Foss and Chloe Le Tissier before powering through in 6 games. The Stacey twins won all of their matches in straight games, seeing off the pairings of Brandan Ferbrache/Nathan Pinchemain, Corey Brouard/Ryan Gilson and James Rabey/Sam King. The top seeded pairing of Adam Langlois and Alice Loveridge (pictured) will meet 3rd seeds Alex Robinson and Dawn Morgan in the final. Langlois and Loveridge were untroubled during their run to the final which included straight game wins over Joshua Butler/Charlotte Casey, Paul Hainsworth/Beth Priest and Liam Robilliard/Chloe Le Tissier. Robinson and Morgan dropped a game during their 5 game quarter final win over 8th seeds Phil Hunkin and Emma Webb and faced a tough test against 2nd seeds Garry Dodd and Carmen Aniceto in the semi finals. Dodd and Aniceto led the hard fought encounter 3-2 but were unable to close out the match and were edged out of the 6th and deciding 7th leg by matching 13-11 score lines. Top seeds Garry Dodd and Joshua Butler will meet the 2nd seeded pairing of Phil Ogier and Jez Powell in the final. Dodd and Butler did not drop a leg en route and finished with a straight game win over 4th seeded twins Joshua and Lawrence Stacey. Ogier and Powell withstood a fight back in their semi final to get past 6th seeds Scott Romeril and Olly Langlois. The Lions pair led 3-1 before being extended to a deciding 7th game, which they took comfortably. Romeril and Langlois had completed a comeback in the previous round when they overturned a 3-1 deficit to win 11-9 in the deciding 7th against 3rd seeds Paul Hainsworth and Liam Robilliard. The top ranked teams of Dawn Morgan/Kay Chivers and Alice Loveridge/Cleo Rosumek made their way to the final. Morgan and Chivers came through against Beth Priest and Juliette Yeaman in a straight game semi final triumph. Loveridge and Rosumek defeated Carmen Aniceto and Chloe Le Tissier in straight games, however they were extended to 6 games in the previous round by the combination of Sam Kershaw and Paula Le Ber. CI Number 1 Garry Dodd will contest the final against 2nd seed Phil Ogier (pictured). The top 8 seeds made their way to the Quarter final stages as expected, with 3rd seed Alex Robinson coming through a tough Last 16 tie against Scott Romeril in 6 games. Dodd overcame the number 5 seed Joshua Stacey 4-2, which was the same score that Phil Ogier achieved during his Quarter against 7th seed Paul Hainsworth, overturning a 2-1 deficit on his way to victory. Joshua Butler defeated Lawrence Stacey 4-1 and Alex Robinson came back from 3-0 down to defeat 8th seed Liam Robilliard 11-9 in the 7th. Dodd ran out a comfortable straight game winner over Alex Robinson in the semi final. Ogier came through a lengthy 6 game encounter with Butler to reach the final. Top seed Alice Loveridge will play against 2nd seed Dawn Morgan (pictured) in the final. Loveridge came through against Sam Kershaw, Emma Webb and Kay Chivers without dropping an end. Morgan also impressed with straight game wins over Paula Le Ber, Becks O'Keefe and Chloe Le Tissier. Le Tissier came through an epic Quarter final with the higher rated division 1 player Carmen Aniceto. She battled back from 3-2 down to win 11-9 in the decider. Top seed Corey Brouard will meet 2nd seeded Alderney player Marli Barker in the final. Brouard reached the semi final stage without dropping a game and he came past Ridunian Thomas Cosherill in 5 games to make the final. Barker also reached the semi finals without dropping a game, but needed to overturn a 1-0 deficit to come through against fellow Alderney player Amy Wesley in 5 closely contested games. Top seed Ben Foss will contest the final against the 2nd seed, in the form of Alderney's Jack Ives. Foss dropped the opener during his semi final encounter with Matthew Casey before winning in 5 games. Casey had earlier come through a classic 7 game encounter with Dan Collenette. Ives had a tougher time at the office and was required to fight back from 1-2 to defeat Luke Bichard in a high quality 6 game encounter. Ben Foss reached his 2nd final of the day and will meet the surprise package of 6th seed Ryan Bichard in the final. Foss was emphatic during his route to the final which ended in a comprehensive straight game win over 3rd seed Sol Bower. Bichard had a much tougher time and was first required to come back from 2-0 down to defeat younger brother Luke, seeded 4th in 7 games. In the semi final he came up against 2nd seed Jack Ives, who opened up a commanding 3-1 lead. Bichard remained solid and played some exceptional table tennis to reel off the following 3 games to take the match in 7 games. Top seed Daisy Kershaw will play against Marli Barker in Thursday evening's final. Kershaw dropped an end to Leah Moore before defeating Erin De Carteret in straight games. Barker was a convincing straight game winner over both Star O'Connor and Melissa Johns. 2nd seed Phil Hunkin will contest the final against Whistlers A team-mate and the 3rd seed for the event, Mark Pipet. Hunkin defeated Kay Chivers in a 6 game semi final win. He had earlier seen off the challenge of Carl Le Tissier, also in 6 games. Pipet came from 2-0 behind to beat Trevor Bourgaize in an early encounter but went from strength to strength as the evening went on, culminating in a 5 game win over top seed Dawn Morgan, after losing the opening leg. Number 1 seed Maurice James will play against unseeded Dave Finn (pictured) in the final. James came through a testing 5 game semi final against Ken Falla, in which 3 games were won past the 10-10 scoreline, the 5th ending as a whopping 21-19. Finn caused an upset when he defeated 2nd seed Ian Fitchet in the other semi final over 5 games. The restricted open singles is a brand new event which is open to any male or female player over the age of 21 but under 40. The only exception to this rule is that players to have competed in the Men's Inter-Insular 'Green' trophy event for the previous 2 years are unable to compete. Top seed Paul Hainsworth will meet 2nd seed Carmen Aniceto in the final. Hainsworth defeated Andre De Carteret 4-0 in the semi finals to reach the final after receiving an earlier walkover from Hayley Webb. Aniceto beat Ben Foote and Becks O'Keefe in straight games to book her place in the final. This was another event to go in accordance with the seedings as top ranked Phil Ogier will meet 2nd seed Jez Powell (pictured) in the final. Ogier defeated Sam Kershaw and Mark Pipet in straight games on his way to the semi final stage. Here he came up against fellow Lions player Martin Sarre. The match was an excellent affair with some high quality table tennis on display from both players. Ogier though always had the edge and came through in 5 games. Powell's route to the semi finals was also comfortable after his straight game wins over Trevor Bourgaize and Tim Le Page. In the semi finals he came up against the 3rd seed in the form of Whistlers' Dawn Morgan, who was fresh from a 7 game Quarter final win over Kay Chivers. The opening 2 games were closely contested, however Powell was clinical throughout the match and ended out as a straight game winner. The final will be a repeat of the Under 18 Men's Singles as top seed Joshua Butler (pictured) will compete against 3rd seed Joshua Stacey. 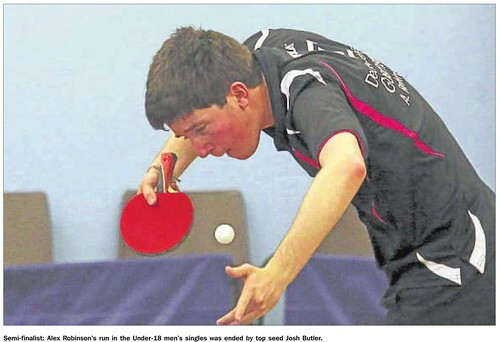 Butler maintained his form from the previous evening with straight game wins over Beth Priest and Liam Robilliard. In the semi final stage he came up against 4th seed Lawrence Stacey and lost the opening leg, his first dropped of the championships so far. He did not let this deter him and came through the encounter in 5 games. Joshua Stacey beat Ryan Bichard in straight games and overturned a 1-0 deficit to defeat Ben Foss in a 5 game Quarter final. In the semi finals he came up against 2nd seeded Alex Robinson in a tough encounter. Robinson opened a 2 game advantage before Stacey stormed into a 3-2 lead. Robinson pinched the 6th to force the decider, however Stacey opened a commanding 9-6 lead. Robinson clawed it back to 9-9 before dumping consecutive backhand drives into the net, ensuring that a repeat final was on the cards. Top seeds Phil Ogier and Jez Powell will contest the final against the 2nd seeded Whistlers pairing of Mark Pipet and Phil Hunkin. The top seeded Lions pair cruised to the final with straight game wins over both Peter Vivian/Steve Martin and 4th seeds Kay Chivers and Keith Opie. Pipet and Hunkin came through against Carl Le Tissier and Sam Kershaw in 5 games and repeated this feat during their 5 game semi final win over the 4th seeds in the form of Martin Sarre and Dawn Morgan. Top seed Dawn Morgan, fresh from her recent outing in the World Table Tennis Championships in Tokyo, Japan, will meet 2nd seed Kay Chivers in the final. Chivers was the first player to make a final of the 2014 Championships after her straight game win over Ravenscroft Panthers player Juliette Yeaman. Morgan followed shortly after with a straight game win of her own over fellow Whistlers player Sam Kershaw, also in straight games. Number 1 seed Chloe Le Tissier will meet the unseeded Daisy Kershaw in the final. Le Tissier was another of the Guernsey World Championship contingent and she came through against Charlotte Casey in 5 games to reach the final. Kershaw was due to play against 2nd seeded Lions player Cleo Rosumek in the semi final, however she was granted a walkover due to Rosumek's withdrawal. Kershaw had earlier seen of the challenge of 11 year old Erin De Carteret at the Quarter final stage, 4-0 the scoreline in that encounter. Top seed and form player Joshua Butler will play against 2nd seed Joshua Stacey in the final. Butler was in cruise control throughout his run to the final and played some quality table tennis during his straight game wins over Darren Sarre, Luke Bichard and 3rd seeded Alex Robinson (pictured) in the semi finals. Stacey was a comfortable 4-0 winner over both Ryan Bichard and Joseph Bourgaize before coming face to face with twin Lawrence in the semi finals. There was a plethora of lengthy rallies, however it was Joshua who got the better of Lawrence in 5 games on this occasion, winning 3 of his games by the narrow score of 11-9.